As is abundantly, and possibly by now irritatingly, clear these days to anyone who follows the blogs or training logs of ultrarunners who call the Sun Valley area home, April running revolves around Carbonate Mountain (Carbo). Basically, it's the only bare singletrack with decent vert for miles around, so as I said in a previous paean to Carbo (here), we live on its slopes mid March to early May. It's a great tester of a climb (3 miles with about 1350 ft), yet, apart from the rocky ridge near the top and the 360 degree views that affords, it's pretty nondescript trail. However, one feature that draws my attention almost every time I see it and no matter how hard I'm breathing, is the abandoned mineshaft at the summit. It's got a diameter of about four yards at the mouth, goes nearly straight down, becoming increasingly narrow, with a perceived but yet no clear bottom in sight. Sitting completely unprotected and unmarked right at ground level - and this time of year hiding under a thinning crust of snow - it begs for visitors. And has had some over the years. This morning, one of the runners in our group (not AJW or me, figure it out if you want) nearly took a notable misstep onto the mine's crusty cover. And last year, the dog of one of our running buddies had to spend a cold lonely night in the rocky shaft after falling through. She was rescued the next morning a little cold and hungry but otherwise in good shape. 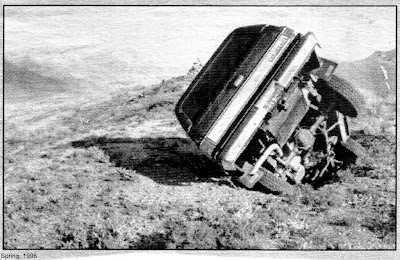 Most entertaining is the hapless driver in 1996 who endo-ed his Blazer into the top of the shaft and, in addition to the humiliation, had his cassette tapes stolen from his stranded vehicle by hikers much less kind than my running friends and I. How he even drove up there is a mystery to me. Ok guys, time to get a work crew up there with some 2x4s and cover that hole. With so many people using that area it seems like the right thing to do. They should have just left the SUV in there. In reality, I think a modest trail marker-type sign would probably be warning enough.